Cathy's Card Spot: Tangerine funky florals. Hi everyone, I got a chance to play with my new zig markers and a new floral die set today. I cut a lot of the flowers and leaves in one pass on my cuttlebug, so it didn't take long to have lots of diecuts ready to colour. I started by sponging some spiced marmalade distress ink onto the flowers with a finger dauber, then spritzed this with water to give a light orange base colour. Then I coloured around the edges with a bright yellow zig marker. I used a water pen to blend this in. To tone down the brightness I added a touch of vintage photo distress ink on the edges. The greenery is coloured with olive green and the centres with yellow. I added a touch of sparkle with a clear wink of stella pen. CAS Mix Up Card Challenge where the theme is to colour diecuts. My other elements are sponging, stamping wet embossing and die cutting. At Less is More it's a colour challenge, olive and tangerine. At Addicted to Stamps & More it's anything goes. Simon Says Stamp Monday want us to add a little sparkle. At Work it Wednesday the theme is the great outdoors. Sizzix funky floral#1 dies; distress inks; zig clean colour brush markers; wink of stella clear pen; Annabelle Stamps sentiment (Fanciful Flowers set); versafine ink & clear ep; hammered card base. When I see this lovely card I think I love clean and simple. This is so outstanding. The design stands out so clean and clear and I like the dimension in the paper. Wonderful card, love that white space. Great match for all the challenges. Cas perfection, gorgeous colours and so very cute. 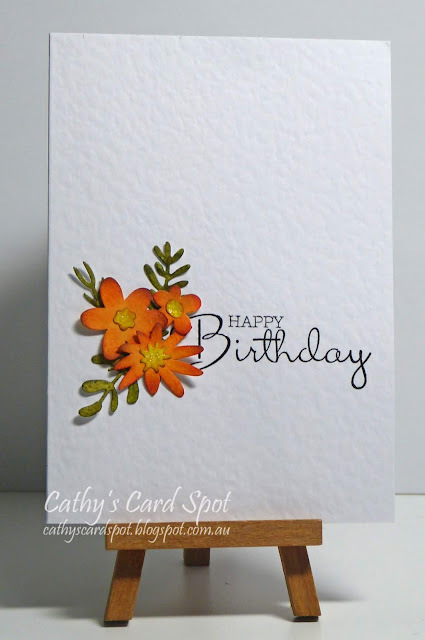 Love seeing this card in the gallery Cathy, thank you for joining in again at The CAS Mix Up Challenge x.
Oh, wow !! What a beautiful card! 1000% of the most beautiful CAS! Such a pretty bouquet of flowers, Cathy! Love the coloring and how the sentiment nestles into the bouquet! Thanks so much for sharing this with us at CAS Mix Up! This is such a perfect example of a beautiful CAS card! I love the cluster of flowers along with that great birthday sentiment! Beautiful! Beautiful card, Thank you for joining at Addicted to Stamps and More and waiting to see next time. Beautiful intense flowers with an amazing CAS design, simply elegant. Thanks for joining us at CAS Mix Up! Again there is that awesome card stock! What a stunning CAS card Cathy. Love the bright colours on your wee flowers. Wowza! Gelatos and a tree frame. Summer Fun with brilliance wax and gelatos!